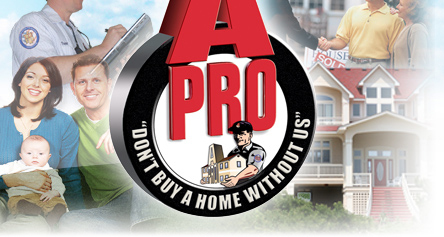 Since 1994, A-Pro has been helping its clients make smarter, better and more informed decisions as they buy or sell a home. As one of the leading Salt Lake City Home Inspection service companies, A-Pro not only offers you the best possible home inspection, service, and value, but also provides you with the peace of mind that your investment is protected through our iron-clad 120-day assurance guarantee. You are currently browsing the A-Pro Salt Lake City Home Inspection blog archives for August, 2017. "Home Buyer's and Seller's Guide to Radon"
Buying a Home… HUD has answers! Before deciding on purchasing a home, it is advised to have those cracks checked by an experienced home Inspector. In addition to noting the presence of cracks in the home inspection report, the home Inspector will be able to let you know if they are merely cosmetic concerns or red flags of more costly damage. In drywall, for example, small vertical settlement cracks (caused by frame shrinkage and fluctuating seasonal temperatures) that run along abutted joints generally do not warrant too much concern by a home Inspector unless combined with other factors, such as water damage and foundational problems. The Salt Lake City Home Inspection will note the presence of these “hairline” cracks in the report. On the other hand, stress cracks may be an indication that structural movement has occurred. If larger than ¼ inch in width, running diagonally across a wall (often originating in corners of wall openings), and tapered from large to small, wall cracks take on a heightened sense of urgency to a Salt Lake City Home Inspection. If these internal stress cracks are accompanied by external cracks in the same area, this will call for further evaluation of the home’s foundation. Other tests, such as checking for sticking bathroom and bedroom doors and measuring to determine if floor joists are sagging, can help the licensed Salt Lake City Home Inspection gauge the seriousness of a situation. Salt Lake City Home Inspection: Examine the area around a drywall crack. If you see nail or screw heads which have popped out of their wood studs, this may be an indication of structural movement.